The NFL is a here today, gone tomorrow business — "hometown discounts" are discussed far more than they actually happen. But that doesn't mean Frank Clark is headed for free agency. Bob Condotta also answers questions on Kam Chancellor's future and the safety position. It’s time for another Seahawks mailbag! As always, you can ask questions via Twitter at @bcondotta, or via e-mail at bcondotta@seattletimes.com. Does Clark give any sort of home town discount given 'Hawks were willing to take a chance on him in round 2, when everyone else was gun shy? Of course, you probably want more than that. OK, maybe you want more than that. He’s not going to do it. Nor do I really think fans should make this a consistent expectation of players. The NFL is a here today, gone tomorrow big-business endeavor and I think the idea of “hometown discounts” is discussed much more by media and fans than it ever really happens. 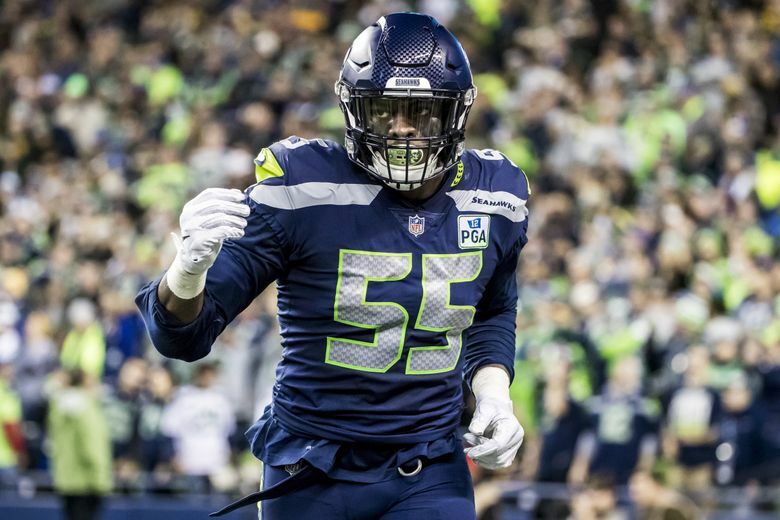 I delved into Frank Clark’s situation last week with help from former NFL agent and salary cap maven Joel Corry, who explained it pretty well — Clark and his agent, Erik Burkhardt (who was in the news this week for signing Kyler Murray) seem prepared to play the hardest of ball possible, willing to accept the franchise tag for 2019 (which would mean a one-year, guaranteed salary of right around $18 million — tag numbers are officially set in the spring) rather than take a long-term deal they consider as below his market value (or, what a hometown discount would be). And if maybe that’s not totally ideal, it does allow the Seahawks to get an elite pass rusher in his age 26 season while then continuing to work toward a long-term deal — if the Seahawks decide that’s what they want to do. As Corry noted, this is regarded as a really good year for pass rushers in the draft. Seattle could well take one in the draft (the Seahawks had probably better at some point) and depending on how that pans out, maybe give them some flexibility moving forward in how they handle Clark. The tag period begins next week — Tuesday, Feb. 19 — and runs through March 5. Don’t necessarily expect the tag to happen right on the first day — there’s no compelling reason not to wait. But it seems more likely to happen than not, which won’t solve the issue of Clark’s long-term future with the Seahawks but will assure it for 2019. Of the players that went on IR before the season or early in the season, do you anticipate any of those players are strong candidates to make a significant contribution next season? Thomas is by far the biggest name of the 10 players who ended the regular season on Seattle’s Injured Reserve list (safety Delano Hill was also add to IR after the regular season prior to the playoff game against Dallas). There were nine others: running back C.J. Prosise, safety T.J. Mutcherson, linebackers Emmanuel Beal and Mychal Kendricks, defensive end Ricky Ali’fua, offensive linemen Jordan Simmons and Jamarco Jones, receiver Amara Darboh and tight end Will Dissly. Of those, six could have key roles for the Seahawks next season depending on health and other factors — Prosise, Kendricks, Simmons, Jones, Darboh and Dissly (as well as Hill). Dissly obviously has the most wide-open path, assuming no setbacks in recovery from what was a brutal knee injury, having already been essentially the starting tight end when he was injured. Seattle had hopes Kendricks could be the starting weakside linebacker in 2019 if needed. But that is dependent on his being available and the team apparently isn’t now going to know that until April (his knee injury wasn’t considered serious). Simmons could contend for a starting guard spot if he recovers well from a knee injury — coach Pete Carroll said it was expected Simmons would be ready for the 2019 season. Just how ready Seattle thinks he will be could factor into how aggressively (or not) they try to re-sign J.R.Sweezy and D.J. Fluker (recall the Seattle offense functioned just fine in the two games Simmons started and played all of — the loss in LA against the Rams and the win over the Vikings). Prosise, Jones and Darboh should also all be ready for training camp (if not the offseason program) and also all could project to having spots on the 53-man roster this season. The Seahawks were particularly excited about Jones when he went down with an ankle injury and he could emerge as a serious contender at right tackle, which could also have implications on Germain Ifedi’s future. Of the other three, Beal might be the one to watch, particularly considering what happens at the WLB spot. He was getting looks at both the inside LB spots before he was injured. And it may be worth remembering that all designations such as the injured list dissolve at the end of the season. All of the above players are now simply on Seattle’s roster. Teams can have to 90 on their offseason rosters. Lists such as IR and PUP come into play again once training camp starts. @bcondotta what are the chances of the Seahawks going after a top safety this off season? A: In the draft, I think they definitely could. I compiled some of the mock drafts recently and who they see the Seahawks taking if they keep the 21st pick last week, and as you can read, a few had Seattle taking Deionte Thompson of Alabama and a few others had Seattle going with Nasir Adderley of Deleware. Each seem like logical picks. However, I think Seattle likes its young safeties (Delano Hill, Tedric Thompson) better than fans might — it’s hard to live up to what Thomas and Kam Chancellor did — and Carroll seemed pretty enthusiastic at the end of the year about a possible pairing of Hill at strong safety and Bradley McDougald at free, something the team got a glimpse of in the late-season wins over Kansas City and Arizona. That pairing might well have been the way Seattle would have gone in the playoff game against Dallas had not Hill gotten hurt. If you mean Seattle going after a big-name free agent, I think there’s less of a chance they pay big money to get someone like Lamarcus Joyner, Landon Collins or Tryann Mathieu — who are probably the top three big-name types available and all could command $8-10 million a year or so (and as lots of others noted this week, Eric Reid’s three-year, $22 million deal with Carolina gives all free agent safeties a better bargaining position this year than they had a year ago). I’d imagine Seattle will again bring in a second- or-third-tier safety (in terms of salary), as they did last year with Maurice Alexander, to add some depth and veteran competition. What do you think is going to happen with Kam after his release? Do you think he will join the Hawks coaching staff? I would hate to think Kam wouldn't retire as a seahawk. A: I don’t see Chancellor going into coaching — at least, not immediately, and not full time. Chancellor has a lot of other interests (such as his shoe line) and has made a lot of money (he just got $5.2 million in his base salary for next year guaranteed last week, regardless of if he gets cut later in the year, which could well happen). Coaching, at least doing it full-time at the NFL level, is a huge grind with lots of long days and while some former players go into it, an awful lot don’t, having seen up close the kind of commitment it takes. As for Chancellor retiring as a Seahawk, though, that’s a certainty. The reason we are at this point is because Chancellor can’t play anymore due to injury (recall he revealed in September he has spinal stenosis). So he won’t be playing anywhere else and will retire as a Seahawk. And maybe he will hang around in some capacity. Regardless, he’ll always be a part of the Seahawks family. A: This is a good and logical question. The problem is, any answer at this point of the year is premature. We really need to know not only what moves the Seahawks make over the next few months in the draft and free agency but also what moves their opponents make, and specifically the teams in the NFC West that Seattle will each play twice next season, before making any reasonable predictions on next year. While the overall core of the Seahawks’ roster may not change greatly, the team can definitely stand for some improvement in the offseason — specifically, shoring up the defensive line and pass rush, answering who is going to play weakside linebacker, maybe adding a veteran at safety (as discussed above) and adding another potential playmaker or two on offense. That it’s still pretty early in the game to make predictions is evidenced in the fact that the Las Vegas sports books don’t yet have over-under totals for the 2019 NLF season — they also wait until rosters are put together and we have a lot more to go on. But one person who did recently offer a guess at a Seahawks over-under total was ESPN’s Bill Barnwell, who put it at nine. To me that seems more than fair. Barnwell makes one interesting point — did the Seahawks catch some teams off-guard this year with the run-first approach, which they won’t next year? Maybe more pragmatically, as I noted above, I’d also want to see how the offensive line comes together — do they re-sign Sweey and Fluker, and if not, who replaces them? — as well as what additions they make on defense to add a pass rusher and figure out the weakside linebacking spot, as well as adding another receiver. So check back in May once we know more about all of those things.